“. . . Hunters and trappers today make me feel like it’s unsafe to go into the mountains any more. Too dam dangerous with them there. Why, they shoot anything that moves. Leave their traps with animals in them, letting them die and waste away before going to get them. No good to anybody then. Makes me mad, disgusted what some of them do in my mountains — my family settled this area — it’s very sad!” Bob Pritchett, In Mountains for 70 years now, brought up by a pioneer family along the Rogue River. . . It goes without saying that wolf hunting today is done not only irresponsibly, but abusively. Management of the wolves, not only in America but on an international basis, has developed into a tale of horror, abuse, torture, and mayhem. This is documented and proven many times over, shown time and again by wolf hunters and trappers own photographs and slurs. These are found on social networking sites on the Internet, as well as trapper or hunter blogs, and goes along with their outward ignorance — presented within the perspective of bragging-rights. More disgusting is the outright slaughter of the wolf management paradigm established by government agencies, both State and Federal. Civilized options do exist and without killing, but presently being ignored; essentially, this means that our government agencies ignore good science and good management principles, for a minority of people and lobby groups. Also ignored by these same government entities is the reality, the necessity of the wolf within the chain of natural events in their ecosystems and environmental complex (review references). Ironically, our government agencies have ignored, in total and as mentioned, good Science. After perusing many references toward sound principles of wolf management this journalist finds no reputable Research Biologist making a direct statement that the present wolf kill is, in fact, necessary. As a matter of fact just the opposite exists. All attest to the fact the wolf is needed, and a significant part of the life-cycle within all environmental communities they exist within. Most go as far as stating, beyond a doubt, the wolf needs to be relisted on the Endangered Species List before being eliminated in total. And as all Research Biologists will state, as a matter of fact, there exists many options other than killing the wolf for management. Here are two separate discussions, mindful I might add, that relate to reality — options and a different attitude toward the Wolf population that works — key word here — WORKS! Keep in mind the foremost stated conflict with Wolves is the fact of misrepresentation, as a derelict killer of animals and people. Just the mentality alone, of this perspective is ignorant and uneducated — but to claim it as reasoning for a Management-by-Kill action is absurd and moronic, with no details to back it up in science or within real time, to say the least. There exist many more options, but as stated, ignorance apparently is much more simple to deal with, and on a Selective-Information mentality (i.e. make up the truth or change history), rather than deal with the real world — real workable options — real resolution to problems! One magazine article after another, in publications and whose demographic-audience consists of hunters and trappers, generate their misinformed and positive remarks toward the current wolf management situation. These non-science articles are quoted by hunters and trappers, then used time and again by hunters and trappers within their discussions. Wolf Advocates have been criticized for demonizing licensed hunters and trappers. Hunters claim they contributed more to the restoration of wildlife in America than any other group. Not so surprising their statement about their contribution remains unproven, with no references available what so ever to the public, other than perhaps magazines catering to their hunting or trapping readership. And not so surprising, hunters and trappers supposed contributions are not documented within established science reports. But there does exist statements made by many experienced hunters such as Bob, as quoted above, and very negative toward today’s hunters and trappers. Many of us who spend time in the mountains, for example, throughout the year see and notice the cumbersome hunter and trappers, and their waste and irresponsible conduct toward nature, as it is quite obvious. And it is escalating into vast numbers across America. The situation comes to mind of a few years back. Several hunters come up to Oregon for Elk. They shot twelve Bull Elk, and simply left them to rot in a circle around their campsite. Yes, they left the Elk there, untouched except for the bullet holes. More than likely a photo-op and comparable to the photo-op’s of wolves after the kill. Or the trappers who shoot bear, on many occasions, only to cut the paws off and take the teeth, for money. The rest of the Bear left to rot on the side of the trail or in a roadside ditch. When the livers and ovaries of Bears were bought for large amounts of money, this too become critical to the Bear’s world. Is this contributing to the natural habitat? Many say NO! Many noteworthy scientists say that the hunter and trapper history speaks for itself when talking about irresponsibility on a large basis and in regard to our nation’s wildlife. That hunters and trappers that demonstrate irresponsibility, bad ethics, a shoot anything that moves basis, is not to be considered — nor ever has been considered good science nor a positive contribution toward restoration what so ever; The lack of any mention within science, anywhere, of hunters or trappers being a part of an ecologically sound situation speaks for itself. As a matter of fact hunters and trappers offer no science or reference material to support any of their statements. Their education, most often bias, is not management level criteria to be involved within a wolf-management-decision making process. Hunters and trappers simply want to kill wolves for sport, and no other discussion exists in their minds. We need go no further than the hunters and trappers of today and their brag. They place photographs on Facebook, for example, of outright abuse of wolves as well as morbid torture of wolves, wolf families, and wolf puppies. Then have the gull to ask legislators in their common state, to apply more legal attributes’ to gassing wolf families and wolf pups in caves or their dens, to shoot them from the air, or worse, they ask us all to accept the outright torture of wolves as something that should be done! A short series of photos show a hunter had chopped all four legs off of one male wolf. The other hunters are standing around the campfire, beers in hand, laughing while the wolf struggles for it’s final gasp of life, crawling across the campsite for help. But there is none available. The wolf is kicked and stomped until death, by those same mentally impaired individuals within that campsite. We can site further photographs of hunters and trappers as well, as the abundance of photographs of abuse and torture of wolves on the Internet quite large — all have one thing in common, the pride of the hunter or trapper over the tortured death of a wolf. Our government agencies are allowing these types of situations to go on and on, and do nothing about them. We can only derive that the current situations demonstrate the compliance and approval of such actions as mentioned within this article, and of those management people within government agencies currently. These managers of our wildlife, no doubt, should be taken into account and held responsible for the abuse, torture, and mayhem that exists today. If this type of behavior is allowed, by those same managers, one has got to wonder how they become public officials and responsible for our wildlife. As taxpayers, we have got to wonder why they still hold these positions, after reviewing just a small portion of the photos available on the Internet right now. To photoshop the photos, most often, was not done, so that is not a legitimate excuse, rather ignorance at its best fed to a hopefully gullible pubic. No, these people holding a public trust, a public office within a government agency must now be held responsible. One photo depicts a wolf, its leg still in trap. The wolf then shot in the hip and shoulder after being trapped, and the trapper allowing it to bleed to death. The trapper, in this instance, glows with pride over what he has allowed to happen and within the foreground, the wolf dying slowly in the background. This photo went viral and the individual is also a government worker. Ethical and moral complaints filed against this government worker, but as odd as it sounds was left ignored. A government agency employee! There exist many noteworthy and not so costly options within reasonable wolf management (review references list). 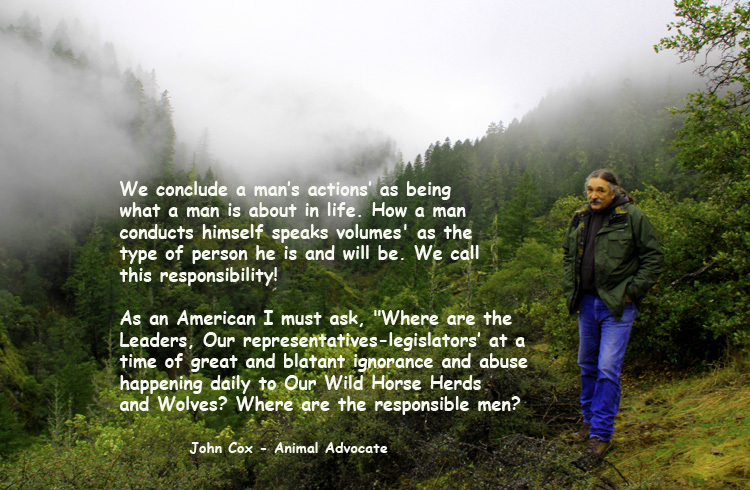 Unfortunately, for the hunters and trappers today it becomes quite obvious the current delisting and hunt does not fit the situation for a proper and responsible wolf-management-paradigm. Even if we take away the hundreds of photographs depicting wolf abuse, torture, and outright mayhem, all done within the past few months, we can still come to a reasonable conclusion about an open-hunt and wolf Kill. Without much regulatory oversight, and the obvious outright hatred directed toward wolves for falsified reasons and misinformation, conclusively trappers and hunters do not have the mentality to handle any types of management paradigms what so ever. It is, for all intents and purposes, a situation out of control — and mismanaged in total. To assume hunters and trappers create a healthy and wholesome environment in our forests and mountains remains ludicrous at best. Demonstrated beyond a doubt, the hunting and trapping industry require heavy regulatory and even observation laws, in order to take away the obvious abuse, torture, and mayhem that is present today. Listed after this article are sound scientific references. This reference material are considered good science within the scientific community as well as the academic community. The references and scientific findings demonstrate beyond any doubt Wolf Hunts and the Delisting of Wolves from the ESL (i.e. Endangered Species List) to be in error. The delisting and the hunt remain inexcusable within our government agencies, and as well quite costly to the taxpayers of America. The hate-filled management principle that does exist currently must Cease! It is disgusting and deplorable to actually assume those who have taken leadership roles within our government and within the decision making process, are not making appropriate decisions’ based on good science, as they should. Good decision making is based on Good Science. Good Science is based on good data, good data retrieval techniques, and well researched ecology systems. Ecological systems studied and researched throughout the years shows, beyond a doubt, the wolf is and always has been within the scientific process, a positive inclusion within any natural or wild ecological system! It is simply time for an over-haul of our government agencies and the personnel within them. It is time for good management and good leadership skills based on provable data and science, taking the place of bad decisions that lead to debatable issues, costly to taxpayers. There exists today useless slaughter of our wildlife, and the ruining of our environment. Good decision making is obvious — bad decision making is just as obvious and disgusting and especially in this instance. If you need evidence simply Google wolf hunt on your computer — and you will be as shocked, as most of us, at what you see — and the people in the photographs call themselves civilized! You be the judge! 1. Bangs, E. E., Fontaine, J. A., Jimenez, M. D., Meier, T. J., Bradley, E. H., Niemeyer, C. C., Smith, D. W., Mack, C. M., Asher, V., and Oakleaf, J. K. 2005. Managing wolf-human conflict in the northwestern United States. In People and wildlife: conflict or coexistence?, eds. R. Woodroffe, S. Thirgood, and A. Rabinwitz, pp. 340-356. Cambridge, UK: CambridgeUniversity Press. 2. Stop Shooting Wolves, You Maniacs, http://www.popsci.com/science/article/2012-12/stop-shooting-wolves-you-maniacs. 4. Mallonee, J. S., & Joslin, P. (2004). Traumatic stress disorder observed in an adult wild captive wolf (Canis lupus). Journal of Applied Animal Welfare Science, 7(2), 107-126. 3. Estes, A. E., Terborgh, T., Brashares, J. S., Power, M. E., Berger, J., Bond, W. J., Carpenter, S. R., Essington, T. E., Holt, R. D., Jackson, J. B., Marquis, R. J., Oksanen, L., Oksanen, T., Paine, R. T., Pikitch, E. K., Ripple, W. J., Sandin, S. A., Scheffer, M., Schoener, T. W., Shurin, J. B., Sinclair, A. R., Soulé, M E., Virtanen, R., and Wardle, D. A. 2011. Trophic downgrading of planet earth. Science. 333:301-306. 4. Federal Register. 2011. 50 CFR Part 17. <http://www.fws.gov/idaho/graywolves/Delisting050411/WolfDelist050511FINALRULE.pdf>Nature and Science, 2011;9(9) http://www.sciencepub.net/nature 182. 5. Fuller, T. K., Mech, L. D., and Cochrane, J. F. 2003. Wolf population dynamics. In Wolves: behavior, ecology, and conservation, eds. L. D. Mech and L. D. Boitani, pp. 161-191. Chicago, IL: University of Chicago Press. T., Fryxell, J., Bayley, S., and Paquet, P. C. 2005. Human activity mediates a trophic cascade caused by wolves. Ecology. 86: 1320–1330. 8. Lopez, B. 1978. Of wolves and men. Touchstone: Simon and Schuster. 11. Mallonee, J. S. 2010. The truth about wolves. Flathead Living Magazine. Summer:108-111. 12. Mech, L. D., Smith, D. E., Murphy, K. M., and MacNulty, D. R. 2001. Winter severity and wolf predation on a formerly wolf-free elk herd. Journal of Wildlife Management. 65(4):998-1003. 13. Mech, L. D., and Boitani, L. D. 2003. Wolf social ecology. In Wolves: behavior, ecology, and conservation, eds. L. D. Mech and L. D. Boitani, pp. 1-34. Chicago, IL: University of Chicago Press. 14. Mech, L. D., and Peterson, R. O. 2003. Wolf-prey relations. In Wolves: behavior, ecology, and conservation, eds. L. D. Mech and L. D. Boitani, pp. 131-160. Chicago, IL: University of Chicago Press. 15. Miklosi, A. 2007. Dog behaviour, evolution, and cognition. OxfordUniversity Press. 20. Montana Fish, Wildlife, and Parks. 2009. Montana gray wolf program. 25. Packard, J. M. 2003. Wolf behavior: reproductive, social, and intelligent. In Wolves: behavior, ecology, and conservation, eds. L. D. Mech and L. D. Boitani, pp. 35-65. Chicago, IL: University of Chicago Press. 26. Packard, J. M. and Mech, L. D. 1980. Population regulation in wolves. In Biosocial mechanisms of population regulation, eds. M. N. Cohen, R. S. Malpass, and H. G. Klein, pp. 135-150. New Haven, CT: Yale University Press. 27. Raven, P. H., and Berg, L. R. 2004. Environment. John Wiley and Sons, Inc.
29. Sime, C. A., Bangs, E., Bradley, E., Steuber, J. E., Glazier, K., Hoover, P. J., Asher, V., Laudon, K., Ross, M., and Trapp, J. 2007. Gray wolves and livestock in Montana: a recent history of damage management. In the Proceedings of the 12th Wildlife Damage Management Conference. pp. 16-35. 32. Switalski, T. A., Simmons, T., Duncan, S. L., Chavez, A. S., and Schmidt, R. H. 2002. Current public attitudes toward wolves in Utah. Natural Resources and Environmental Issues. 10(1):1-3.